If you’re anything like most bodybuilders, chances are you consider choosing which prohormone to go for in your program as a crucial step to sculpt the physique that you’ve always wanted. But the thing is with so many options to pick these days, zeroing in on the best one for you can be a bit tricky. However, there’s a fairly new prohormone called Androstanediol (5-aa) that claims it can pull the whole thing off in getting you on the right track to your dream body. 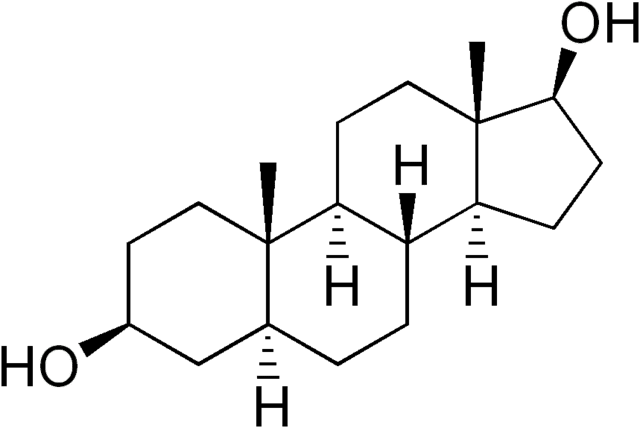 Why don’t we give Androstanediol (5-aa) a closer look in a bit to see if it’s really worth having in your bodybuilding checklist anytime soon? The chemical structure of Androstanediol (5-aa). At its simplest, Androstanediol (5-aa) is a type of endogenous androgen that can be used for bodybuilding supplementation. It is a precursor of dihydrotestosterone or more popularly known as DHT, which is a type of hormone that plays a key role in the physical development of males, particularly during puberty. Surprisingly, DHT starts out as testosterone and gets converted as it passes through the prostate and testes in men and the ovaries in women. Only a very small amount of testosterone is converted to DHT per day, though. Medical researchers point out that only around 10% of the total testosterone produced in the body gets converted to DHT. What’s really interesting is DHT is much more powerful in terms of anabolic effects than testosterone. In fact, many of the benefits of testosterone can only take place after it is converted to DHT. Androstanediol (5-aa) is administered orally. What Does Androstanediol (5-aa) Do? Androstanediol (5-aa) basically boosts your body’s testosterone levels to kickstart the anabolic effects you need to achieve the bodybuilding goals that you’ve set like getting serious lean muscle gains, taking your strength and endurance levels up a notch as well as picking up the pace on your recovery. It is also important to take note that Androstanediol (5-aa) can’t be converted into estrogen and has the ability to prevent the conversion of estrogen while at it. You can think of it as a prohormone and aromatase inhibitor rolled into one. Does Androstanediol (5-aa) Have Any Side Effects? Since Androstanediol (5-aa) is a fairly new prohormone, there still aren’t any feedback from bodybuilders and fitness enthusiasts about the adverse side effects that it can trigger when used for supplementation. We will update this post as soon as we can when we come across any side effects that can be caused by using Androstanediol (5-aa). What Products Have Androstanediol (5-aa) in Them? The only products that we can find having Androstanediol (5-aa) in their formulation are Molecular Nutrition's Viratase and M-5AA from Underground Laboratories. Again, we will update this post in the soonest time when we come across more information.